6:30am – Alarm goes off! Time to get out of bed and get ready for another busy day! 7:30am – Grab a quick coffee on the run… and a bottle of water – must keep hydrated! 8:00am – 9:15am – Lecture time! Topic of the morning is bleaching discoloured teeth that have had previous root canal therapy. 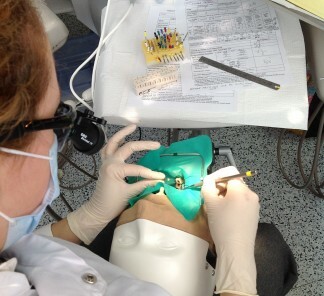 9:30am – 12:20pm – Simulation Clinic – Root Canals! Today we’re doing root canals in the simulation clinic with previously extracted teeth mounted in an artificial “phantom” head. 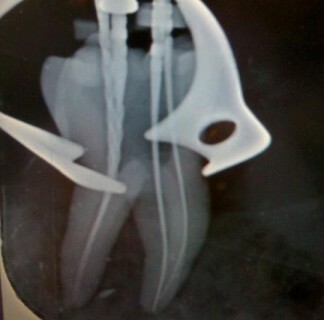 The set up is such that we can take x-rays and simulate a real root canal therapy! 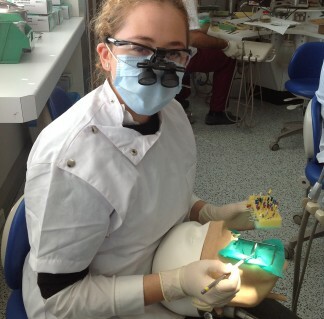 Today’s challenge: finding canals in multi-rooted teeth! 12:30 – 1:00 – A quick honours meeting with the professor of orthodontics to discuss aspects of my research. We’re trying to find out if there is something in patients’ blood or saliva that may make them more prone to root resorption! 1:00pm – 1:15pm – Time to squeeze in a quick bite to eat! 1:30pm – 4:30pm – Back in the simulation clinic to finish off our root canal whilst the other half of our class are seeing patients in the denture clinic next door! 4:40pm – 6:00pm – Evening lecture – a specialist tells us about the different surgical and non-surgical techniques for treating very inflamed gums! 6:30pm – 7:30pm – Normally I would have a group study session with my friends, but today it’s our monthly dental student union meeting… I’m chairing the meeting for the first time, since the President is on rural placement! We order pizza and drinks and talk about our day, things we can do to make a change, and other organisation based things! 7:30pm – 11:30pm – Home time! Time to get home and hit the books before bed! Need to study for the exams coming up – a face-to-face panel of specialist surgeons (trained in medicine and dentistry) asking us anything we have learnt in the past 3 years – a very stressful but worthwhile training program! 11:30pm – Pass out! Phew what a day! Eyes are shutting as I brush my teeth before bed! Tomorrow is another busy day in clinics – seeing actual patients! Next week: Meet the team – Maggie’s first blog article.